Arabic decor brings unique vibe into modern interior decorating. Exclusive penthouse interiors with Arabic flavor are designed by architectural studio Nograph in Moscow. 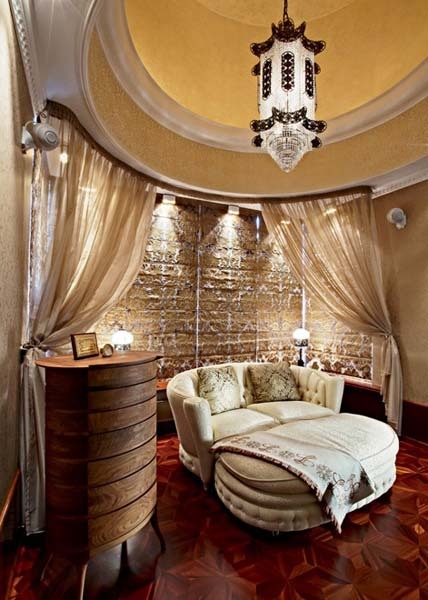 Luxurious three story penthouse design is located in Moscow and offers comfortable and beautiful ethnic interior decorating with exotic flavor of Arabic decor. Arabic decor style is amazing and gorgeous. Arabic home decor ideas attract attention of world’s most famous interior designers, reflecting one of modern interior design trends of creating beautiful and unique rooms with an ethnic interior flavor. Arabic home decor ideas are popular and loved by people who appreciate comfortable chic and luxurious functionality of natural fabrics and interior decorating materials. Arabic decor accessories and furniture, wonderful textures and detailed ornaments, unusual color combinations and intricate motifs in Arabic decor add coziness, warmth and exotic flavor to this unique interior design style. Arabic decor includes Moroccan interior decorating ideas, bringing stunning home decorations and unique Arabic touches to modern interior design, and creating warm and welcoming rooms, perfect for relaxing and pleasant lifestyle. Wool rugs and decorative cushions, luxurious draperies and carved wood furniture bring ethnic interior flavor of Arabic decor into modern penthouse design. Arabic decor motifs make plaster ceiling decoration and crystal chandelier design look exclusive, adding ethnic interior details to dining room decorating. Stained glass windows remind traditional Arabic arabesque patterns. Beautiful stained glass windows create a stunning glare, lighting up a room and filling an ethnic interior with romantic atmosphere. 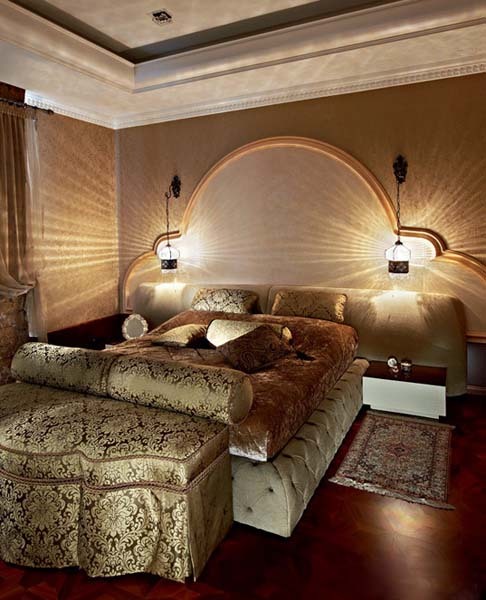 Plaster moldings and beautiful wallpaper add attractive Arabic decor motifs to modern interior design. 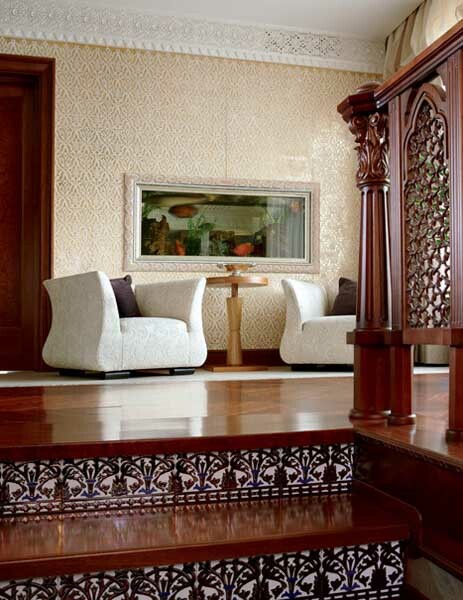 Carved wood decorations and mosaic tiles add Arabic decor motifs to ethnic interior design. 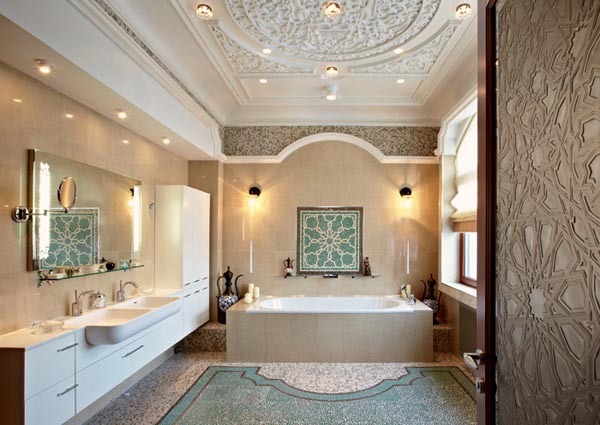 Green color shades of mosaic tiles in the bathroom, arabesques and Arabic decor accessories create pleasant interior design in Eastern style. Comfortable brown and green color shades of soft furniture upholstery fabrics and wallpaper, combined with golden colors, silk rugs and soft light create rich Arabic decor in the bedroom.